What is Valero Crude By Rail? The Valero Benicia Refinery proposes to import 70,000 barrels of oil each day (total of 100 rail cars per day). Valero admits that this would include North Dakota Bakken crude – implicated in six explosive train derailments in recent months (July ’13 – April ’14). The project may also bring in diluted Canadian tar sands crude, the world’s dirtiest crude oil. Because refining extreme crudes creates more pollution than conventional crude and poses devastating safety risks and increased harm to the environmental and public health, community organizations along with governmental agencies (such as the California Attorney General’s Office and the US Dept. of Transportation) have expressed grave concerns over transporting crude by rail. 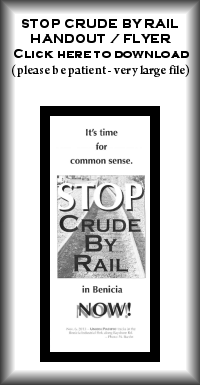 We stand firm together for a Safe and Healthy Benicia – Stop Crude-By-Rail ! 1. CRUDE – Crude oil by rail begins in a stripped, fracked and fouled landscape in America’s northland, and ends in our backyard. Bakken shale crude and diluted tar-sands bitumen is the last gasp of a dying fossil fuel industry. 2. RAIL SAFETY – In light of recent derailments in Canada and the US, multiple serious questions arise: who would be in charge in the event of a catastrophic explosion; who would pay for cleanup; who would monitor and enforce railroad crossings? Who would insure against catastrophic loss of the Benicia Bridge, the Clocktower, the Camel Barn, the Arsenal Historic District, the Refinery itself and surrounding homes, Robert Semple School and other businesses in the industrial park? 3. HEALTH – Valero wants to offload crude oil from one hundred huge (80-foot) railroad tank cars every day. Each car will require connect-disconnect operations that will increase toxic vapor emissions. Processing highly acidic tar sands would also risk increased corrosion, more air pollution and increase production of petroleum coke (pet coke). The quality of our air would be severely impacted. A spill of tar sands in the marsh would be impossible to clean up. 4. ECONOMICS – There will be a small number of jobs created. But there is no long term financial gain for Benicia. The added risk to our community of allowing “bomb trains” carrying Bakken oil into Benicia could lower home values and lead eventually to a net loss of revenue to the City of Benicia, especially in the event of a major train derailment involving spill and/or fiery explosion. 5. UPRAIL AND DOWNWIND – Valero and the City of Benicia appear NOT to be considering the huge increase in crude by rail throughout the Bay Area, nor the health and safety of communities uprail of Benicia where some schools, downtowns, and commercial centers are well within a potential blast zone if one of Valero’s trains derails or spills. We stand with our friends and neighbors: the buck STOPS here! Community Forum & Update, Jan. 18, 2015 – Speakers: Antonia Juhasz, Diane Bailey, Marilyn Bardet, Andrés Soto. Many thanks to Constance Beutel!